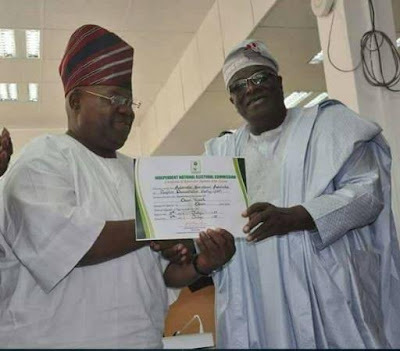 Today, NEC National Commissioner, Prince Adedeji Soyebi presented Certificate of Return to the winner of the Osun West Senatorial bye-election, Mr Ademola Adeleke, at the INEC headquarters in Abuja. Ademola who is the younger brother of the late Sen. Isiaka Adeleke, polled 97,480 votes to defeat former Sen. Mudashiru Hussein of the APC, who scored 66,116 votes. At the ceremony, Adedeji advised citizens to always create the enabling environment for peaceful elections for the commission and he also commended the people of Osun West for their peaceful conduct during and after the Saturday election, saying that they have set precedence for Nigeria election.